But back to Uhtred’s new woman, his bride Mildreth. Her face is covered when he meets her raising the question of what might be wrong about her appearance. I don’t know of any Anglo-Saxon tradition that would hide a woman’s face in this way, and it seems to me that the creators of the show have used this device as a kind of visual shorthand to put the audience in Uhtred’s shoes, raising the tension and misgiving – how ugly is she? – in the scene without the internal monologue that Cornwell used in the novel. And it works. And, as in the novel, the problem with Mildreth is not her appearance, but the burden of debt that comes with her. A minor point: when we see Mildreth on horseback, she rides side-saddle. The concept of a side-saddle drives historical novelists crazy. When was such a thing first used? Not as early as the 9th century, I would hazard. But again, this is visual shorthand, differentiating the nobly born Mildreth from Brida who we saw riding astride. Nevertheless, in the 9th century women probably rode astride, or traveled in a litter, a cart, or a very cumbersome, uncomfortable – and slow – wagon. Uhtred now has one good friend among the Saxons, and actor Adrian Bower is a marvelous Leofric. He is older, wiser, and more experienced, at least when it comes to the king, than Uhtred – a comrade-in-arms in a way that Uhtred could never be with Alfred. And it’s important to remember that Uhtred is not a man of Wessex. He is an outsider, a Northumbrian and, even worse, has been raised by Danes. It is not surprising that the men of Wessex don’t trust him. Which brings me to Alfred. And now we see just how ruthless a 9th century king had to be – willing to risk the lives of men he would have known personally to attain his ends. Alfred chooses the men who will go as hostages to the Danes, and neither he nor the hostages have any illusions about what this means. Poor Father Selbix (in the book he is Alfred’s cousin) is physically sick at the thought of the kind of death he may face if worse comes to worst. I found this entire segment dramatic and moving, and viscerally representative of how terrifying that prospect must have been. David Dawson’s portrayal of Alfred continues to impress me, as the king becomes hardened by his experiences. 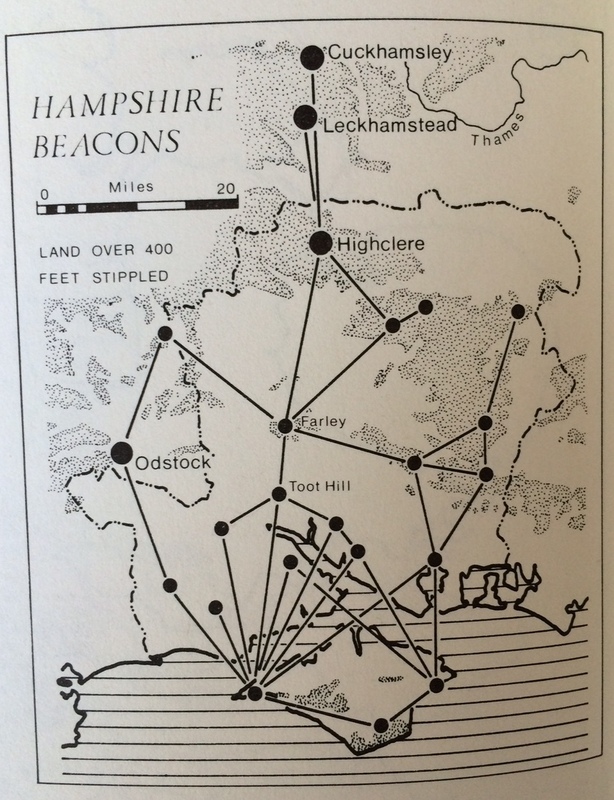 Uhtred’s departure from Wareham closely follows the events in the novel, but the final scene – the lighting of the beacons which, I can’t help it, I just loved it – was original, and perhaps a nod to Tolkien’s lighting of the beacons of Gondor which was itself based on the system of warning beacons in Anglo-Saxon England. Oh, well done! This entry was posted in Anglo-Saxons, History, The Last Kingdom, Vikings and tagged Anglo-Saxons, history, King Alfred, Tolkien, TV Series, Uhtred. Bookmark the permalink. Great analysis. The actor playing Alfred is amazing. Thank you for commenting Ellen! I cannot say enough good things about actor David Dawson! I so enjoyed last night’s episode. I know there was nothing in the book about Uhtred coming out of the river naked, but a bit of visual never goes wrong.Guthrum was brilliant. Hi Moira. I agree, Guthrum was brilliant, in an awful way of course. Love your comment about Uhtred and the river. Although Cornwell never wrote a scene about it, I’m pretty sure Uhtred must have done that on occasion! Copyright © 2012-2018, Patricia Bracewell. All Rights Reserved.